Countries we ship: China, Korea, Japan, Taiwan, Myanmar, Thailand, Macao, Hong Kong, Laos, Vietnam, Cambodia, Malaysia, Singapore, Indonesia, Philippines, India, Turkey, Finland, Sweden, Norway, Denmark, Russia, Lithuania, Ukraine, Poland, Czech Republic, Hungary, Germany, Switzerland, Austria, Holland, Belgium, Canada, USA, Mexico, Belize, Australia, New Zealand, and South Africa. The time of shipping and arrival will depend on Airport Services. For more information in English, please call us at +886975785398 or +886963110478. Hello Poodle Papa and Mama~ In YouLong we have all kinds of teacup poodles for you. We assure you that this is the most professional and best website of teacup poodles. In YouLong, we have miniature teacup poodles, super tiny, pocket teacup, teacup poodles and toy poodles. You can find all kinds of information about miniature teacup poodles, super tiny, pocket teacup, teacup poodles and toy poodles here. The best and supreme toy, miniature teacup, super tiny and pocket poodles are at YouLong Breeding Center. This is the story of Teddy Mommy and teacup poodles. 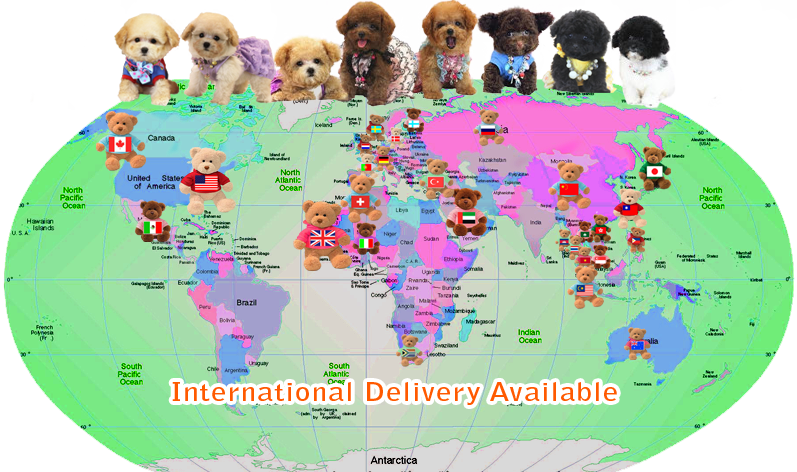 Miniature teacup poodles, super tinny teacup poodles, pocket teacup poodles, teacup poodles or toy poodles at YouLong. white poodle, chocolate/brown poodle, apricot/cream poodle, silver/gray poodle. We offer many choices on colors, and we believe you can find the sweetest one, which belongs to you. super tinny teacup poodles, teacup poodles, pocket poodles or toy poodles. we are always here to guide you and answer all your questions about how to raise your poodle.